The quest for the distinction of Youth Superior Versatility Champion is never an easy one. My quest for the title began at a young age even though I didn't realize it then. I started riding at the age of five. My mother allowed me to ride her old good-natured Morgan gelding on the lunge line. I was so small that I constantly lost my rubber boots. After a while, riding in circles wasn't enough. I needed more. So, I started saving every penny for a pony of my own. Finally, at the age of seven, I bought a pony for $250. That was a high price for a little girl, and since I paid so much, I was determined to try anything I could with Blondie. My family and I took her to gymkhanas, trail rides, vaulting clinics and local shows. Fortunately, she was a sweet-natured pony, and we had lots of fun with her. The next year, my brother and I joined the Canadian Pony Club. 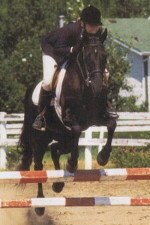 I began riding basic dressage and learning about stadium jumping and cross country jumping. I learned a lot from that little pony. It wasn't long before eleven hands of pony just wasn't big enough, though. I graduated to a slightly larger pony and continued my pony club activities. It was at this time when I was first introduced to Tennessee Walking Horses. My mother purchased a walking mare named Doublestar. I was fascinated by the mare's movement and gait. At first, I had no clue what she was doing, only that it was smooth and looked fun to ride. The more I rode Doublestar, the more I enjoyed it. By the time I was nine, we were in the show ring. I loved it! I learned a lot about different styles and disciplines of riding as I continued riding in the pony club and showing walking horses. 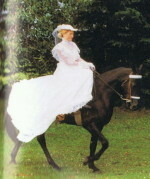 My dressage and jumping skills kept improving, and at the age of 13, I had advanced to riding a huge thoroughbred mare. I faced a dilemma, though. It was extremely difficult to keep up with the training and showing of two entirely different breeds. I loved the thrill of jumping, and the excitement of three-day eventing, and was very serious about success. Each week, I had two and a half hours worth of riding lessons on my thoroughbred mare. I did it, though, because I loved it. When I was sixteen, I made a hard decision. Walking horses won out. I sold my thoroughbred and decided to concentrate on walkers. I showed a mare named DJ's Miss Showtime and did well, but I didn't attempt to diversify very much because the classes were not offered at our Tennessee Walking Horse shows. A year later, I met my cohort, a most wonderful little mare named Carolina Delight. I was seventeen and contemplating what horse I would ride and show during the upcoming show season. It would be my last year in the youth division, and I wanted to leave it with excitement. 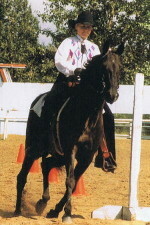 Wayne and Debra Jack brought several of their best horses to a 1995 exhibition of the Tennessee Walking Horse. The exhibition was for the Canadian Minister of Agriculture. Carolina Delight, also affectionately known as Tiny, was one of the gang. She was a beautiful black mare with World Championship honors in model competition. I couldn't believe my luck when the Jacks said they needed someone to ride Tiny during the exhibition. I volunteered, and that's where it all began. I rode the little black mare for two nights. I was amazed at her incredible gait, excellent disposition and beauty. After the final performance, we had our pictures taken. It was sad for me because I was sure that was the last time I would ever ride Tiny. I never dreamed I would have the opportunity to ride her again, let alone for an entire show season. About a month later, we called the Jacks. Deb gave me some incredible news. If Tiny didn't get in foal, I could lease her for the upcoming show season. I was so excited. I knew Wayne and Deb wanted her in foal, but I kept my fingers crossed that she wouldn't catch. It's still hard to believe that my dream came true! Carolina Delight came home with us in March of 1996. I began riding her everyday to prepare us both for the versatility program and for the upcoming show season. This would be my last chance at the Youth Superior title, and I was determined to succeed. Our first show was in June and we won almost everything. Ironically, the one trophy we didn't win was in the model class. That was especially odd since Tiny had already won world championship honors. Together, we earned a lot of versatility points at that first show in five or six different divisions. Still, it takes points in eight divisions to win top honors. I realized that we might not be able to earn enough points in eight divisions to win the Superior title, but I thought we could earn the Versatility Champion title or high point honors in at least one division. We set out for two more consecutive shows. The second of these was an open show for a variety of breeds. Tiny made her usual great performances, and we did very well in everything we entered. At this point, I realized that the tough competition of open, multi-breed shows might be our answer. Not only did those shows have a greater number of versatility classes, they had a larger number of entries. We ultimately took Tiny to four different open shows. They offered us a great opportunity to promote the Tennessee Walking Horse to many people who had never seen one. There were many instances in which people would see us in the warm-up ring and ask what gait Tiny was performing. I would then explain about the walking horse and their smooth gaits. I would even do a mini-demonstration before our class was called. The comments I heard most often were how incredibly smooth the ride looked. One weekend, my mother and I traveled 750 miles to attend two different shows at opposite ends of the province. We traveled late one night through a rain storm only to find the next morning that the rain had made the outdoor arena unusable. Before we left, a photographer from the local paper took our picture and we did a demonstration. The article was titled, "World Champion horse comes to Thorhid". 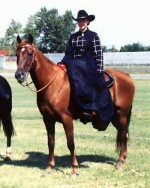 Despite the show's cancellation, the Tennessee Walking Horse was still promoted. My family and I then headed to Southern Alberta for a Standardbred Show. There, we earned many points in the versatility classes, particularly jumping. I had begun to school Tiny over fences only three weeks before this show. My goal in entering the jumping classes was to gain experience for her. I should have never doubted my beautiful little mare. She exceeded my expectations by placing second in a class of fifteen entries. I was ecstatic since I had already earned four of my jumping points. I decided to take her in a class called "jeopardy jumping", which consisted of higher jumps and a very short time to complete the course. In order to place well, hairpin turns and high speeds were necessary. Even though I had planned my course out ahead of time, I had 25 seconds left on the clock. I began to take the higher jumps until I headed toward a challenging jump that resembles a construction blockade. Tiny didn't even hesitate! She sailed over it just as the buzzer sounded! That class allowed us to fulfill the required points for the jumping category and claim high point award in that division. Several people later told me that they had been "cheering for the tiny mare". When I told them that Tiny was her nickname, we all had a great laugh. Tiny's big brown eyes won her points with both the judges and spectators alike. That summer I discovered that Tiny had interests as varied as my own, and she had a personality all her own. I knew this 14.3 hand, black mare was the horse I had begun looking for so many years earlier. At our first show I was drinking a soda and Tiny developed a particular interest in the can. I should have known she was thirsty! From then on, we cut show expenses by sharing refreshments. This past year, I have learned a great deal about perseverance and determination as I achieved 114 versatility points. We needed only 50 points in eleven categories, but this was my last summer showing as a youth, and I wanted to experience as much as I could. We had plenty of obstacles to overcome, particularly in the trail division. Tiny is not the bravest horse in the world, and we had to work especially hard in those classes. I have even learned that a certain judge (and friend) named Ray Reis made a bet with the ringmaster that the yellow slicker on a peg was too much for Tiny. I still hope to get the chance to prove him wrong. My sweet Tiny has now returned home to Wayne and Debra Jack. She's a true champion through and through. I hope that one day she may be mine in every sense of the word. At the 1997 Celebration, the Tennessee Walking Horse Breeders' and Exhibitors' Association and Mr. Jack Kinkade presented me with Tennessee Taz, a beautiful black colt of my very own. I very much appreciate their generosity, and I plan to train the colt and eventually work for my Adult Supreme Versatility honors. That may not come so fast, though, as I am now a student at the University of Alberta studying biology and chemistry. Priorities have to be chosen and college is very important to me. I would like to especially thank Wayne and Debra Jack for giving me the opportunity lease Tiny. My parents deserve my extra special gratitude for spending the greater part of the summer on the road with me. Finally, I encourage prospective youth versatility champions to continue with their efforts, And don't give up. It can be done and it is definitely worth the effort. Thanks to everyone who encouraged me along the way. I appreciate it.